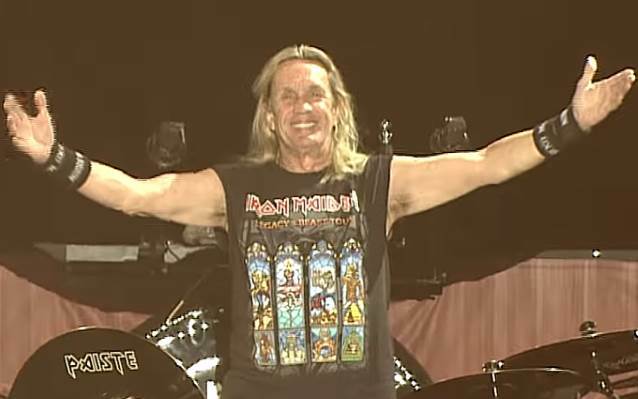 IRON MAIDEN drummer Nicko McBrain celebrated his 66th birthday on Tuesday (June 5) while on tour with his bandmates in Copenhagen, Denmark. Video footage of the musicians marking the occasion can be seen below. McBrain was born in Hackney, East London, on June 5, 1952. His first experience of music came via his father's love of traditional jazz. Young Nicko's hero was Joe Morello, the late, great drummer with the legendary THE DAVE BRUBECK QUARTET. Nicko would often take to the kitchen, using forks and knives to beat on anything he could find at home. Fed up with him bashing up the kitchen utensils, his parents finally bought him his first drum kit when he was 12. By the time he left school at 15, he was already a veteran of several part-time pub groups. Musically, however, his tastes had broadened to include more contemporary sixties sounds from THE SHADOWS, THE ANIMALS, THE BEATLES and THE ROLLING STONES. On the recommendation of another drummer he knew, he began to take on session work, playing on countless different recordings. In 1975, Nicko joined STREETWALKERS, the band formed by ex-FAMILY members, vocalist Roger Chapman and guitarist Charlie Whitney. From the late seventies until 1982 when he joined IRON MAIDEN, Nicko had spent his time in session work, most memorably with the PAT TRAVERS BAND on their 1976 "Makin' Magic" album, and also appeared in the band MCKITTY in the early 1980's. It was during a MCKITTY gig in Belgium that he first met IRON MAIDEN bassist Steve Harris. He officially joined IRON MAIDEN in December 1982 for the 1983 "Piece Of Mind" album and tour, replacing Clive Burr, after McBrain's previous band TRUST had supported IRON MAIDEN during the U.K. leg of the "Killers" tour in 1981. With 13 studio and seven live albums currently under his belt with MAIDEN, Nicko's role as the driving force behind the band's sound has served as a major influence to many of today's top drummers and solidified his place in music history.